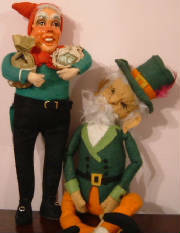 These Irish dolls were made by Jay & Company, Dublin, Ireland. They are all handmade with beautifully moulded faces, handpainted in oils and dressed in the finest of Irish materials. 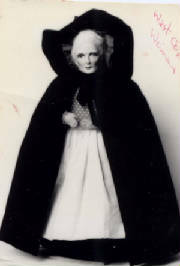 Height 7" and 11"
All during the nineteenth century the hooded cloak was the West Cork woman's characteristic garment, these were a sober black, but a hundred years ago many of the cloaks were brightly coloured, red, pale or dark grey, bottle green, various shades of light and dark blue. In parts of the West of Ireland cloaks of a creamy coloured undyed woollen material were worn. Other parts of the Country too favoured cloakes of homespun materials, but most women preferred fine broadcloth, the cloak was an expensive item of dress, but it lasted for many years and was always in fashion, often the inside was lined with satin of a contrasting or matching colour. The hood was worn on the head or lying on the shoulders. married women usually wore a white frilled cap under it. As time went on the cloak was laid aside and a cheaper substitute for it was found in the shawl, which now in its turn has yielded to the changing fashion. 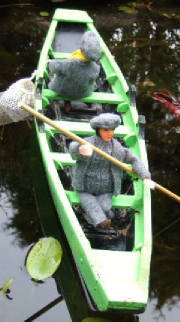 Abbey fishermen in their angling cot boat. These snap-net fishermen lived in an area known as the Abbey in Limerick City, Ireland. They made their living from fishing on the Shannon river from Corbally to Doonas. With the installation of the hydro-electric scheme in Ardnacrusha in County Clare in the 1920's they were deprived of their livelihood. The Aran Islands are situated off the coast of Connemara, Co. Galway, Ireland. 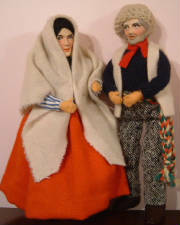 Both men and women of these Islands wear knitted garments of the traditional "Aran" design. In the eighteenth century the women wore a black shawl and scarf. They did their own spinning and dyeing, logwood was used for dyeing the clothes black and madder for dyeing the clothes red. The men, mostly fishermen wore clothes of heavy homespons. They wore tweed trousers, hand knitted Aran or banin sweater, banin is the name of the natural wool which is used in the making of the sweaters - a creamy coloured wool lightly coated in animal oils which gives it a water resistance quality, a crios was worn below the waist to give support when rowing. On their feet they wore pampooties which were to withstand the rough rocks. In those days most of the knitting was done by the men themselves from wool spun by their women folk. This was done with goose quills until the advent of knitting needles. On the Aran Islands it was a matter of very real pride as each family should be known by its own variations of the traditional stitches, in much the same way as clans. To-day, the patterns of these traditional handknit garments are usually worked down the whole length, each featuring several different stitches. All of these stitches have a meaning, some are of religious significance, others relate to the sea or the homes of the fisherfolk. The cable for example represents fishing ropes, the diamonds stands for nets, the trellis reproduces the effect of small fields enclosed by low closed fences. The Irish Leprechaun is a legendary character, renowned for his elfin appearance, he is reputed to be very rich. He is a merry, industrious tricky little sprite, who does all the shoemakers, tailors and cobblers work for the Fairy Gentry. According to the legend he knows all the secrets of hidden treasure, and if he takes a fancy to a you, he will guide you to the spot in the Fairy Fort where the crock of gold lies hidden. The Leprechaun can be a bitterly malicious character too if he is offended, and one should be very cautious in dealing with him, and always treat him with great civility, or he will take revenge and never reveal the secrets of the hidden gold. If you do happen to come across a Leprechaun, you should never take your eyes off him, not even for a split second, because if you do, he will vanish immediately. He will try all kinds of tricks to distract you, but if you succeed in keeping your eyes on him for a considerable length of time he will eventually give in and tell you where his crock of gold is hidden. This little lady comes from County Sligo in the north west of Ireland known as Yeats County, as it was here that one of Ireland's best known poets William Butler Yeats, drew much of his work from the landscape around County Sligo. 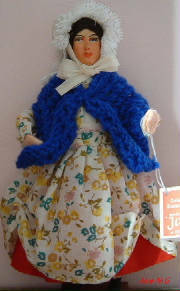 This doll is dressed in the style of the 1830's. 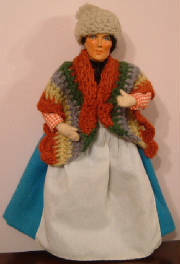 She is wearing a colourful dress which is tucked up at the sides to show off her underskirt, over her shoulders she wears a hand knitted shawl and on her head a mop cap with lace trim.